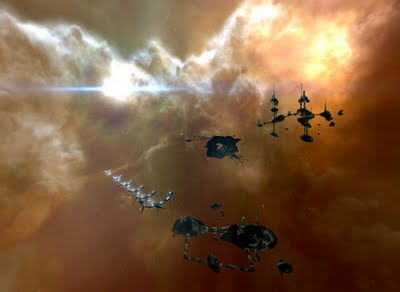 Twice I have ventured into the cold blackness of EVE Online, and twice it’s unwelcoming learning curve and baffling assortment of features drove me away from interstellar travel. Yet again I donned my space-pants for CCP’s infamous MMO, and thus far I have lasted an entire week! 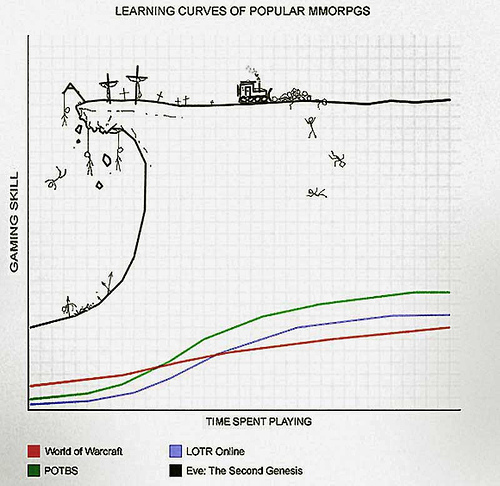 By now you have certainly heard of EVE’s perilously steep learning curve (See image top). Despite revamped tutorials, the game is not much easier to understand since my last foray at least two years ago. The interface, which CCP is still adapting, is jam-packed with information. I can spend hours digging into links about armor shielding, cluttering my display with allusions to story elements and ship modifications I may never encounter. Meanwhile, political realities are constantly shifting, the result of unbridled corporate espionage and backstabbing that sets EVE apart from its MMO compatriots. Looking at the political maps, colors pouring over white, each representing the sovereign territory of a corporation, has a diminutive effect. The universe is so vast and I am so small and ignorant. If EVE remains so overwhelming, why does this time feel different? The most significant factor must surely be my own mentality. The game requires commitment even during its early stages, commitment of both time and mental faculties. I continue to research ship modifications, strategies, best practices, and politics in-game and out. I simply had neither the time nor the patience to follow-through with such rigor during my first two attempts. I must also credit a sense of purpose in my new mentality for my perseverance. One does not simply explore EVE, at least not at first. My purpose, in addition to joining a friend who has been playing for some time now, is to meet and talk to those spacefarers who have long devoted themselves to the game. This sense of purpose got me through most of the confusing and aggravating moments of acclimation. Now, however, the mystery inherent to such a vast gaming experiment fuels me. Space travel, real space travel that is, is an absolute wonder. The night sky staggers the young and old alike with brilliant firmament of possibility. The pure blood of science fiction is the joy of pondering the unknown, perhaps encountering the transcendent or the terrifying. Once I felt comfortable enough in my ship, I was shook by the thrill of mystery. Of course this fictionalized digital universe houses no extraterrestrial real surprises, but the tremendous unknown remains. Real humans are out there, fighting for space they have imbued with meaning, engaging in combat with entire armadas. Elsewhere pirates roam, both AI and human, eager to blast me out of the sky. A million little games are being played out across the stars, some of them quite seriously.